Airplane life-cycle considerations are an important part of Boeing’s strategic environmental efforts. In support of this strategy, Boeing initially conducted a field survey of companies involved in older fleet management and airplane scrapping. Boeing began to focus its efforts on older fleet management with a group of companies that shared a vision for the safe and environmentally progressive management of the world’s aging airplane fleet. BOEING'S GOAL IS TO ACHIEVE 90 TO 95 PERCENT RECYCLABILITY OF THE WORLD’S FLEET BY 2012 BY TAKING ADVANTAGE OF INDUSTRY EXPERTISE AND NEW TECHNOLOGIES. These efforts evolved into the development of a nonprofit industry association called the Aircraft Fleet Recycling Association (AFRA), whose mission is to enable airlines to manage their retired airplanes in an environmentally responsible way while maximizing the value of aging commercial airplanes. Environmental protection is more and more important around the world. AFRA was formed in 2006 partly in response to operators’ desire for clear guidance on the most effective and efficient methods to retire their airplanes. In the two years since its inception, AFRA has produced a “Best Management Practice” document on the management of used airplanes, reclaimed parts, and defined minimum performance standards for companies that manage end-of-service airplanes. 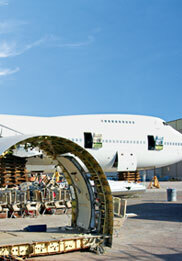 This article will explore AFRA’s origins and objectives, provide examples of the best practices it has developed and the resulting accreditation program for airplane scrapping operations, and explain the benefits to Boeing operators of working with AFRA-accredited companies when retiring airplanes from their Boeing fleets.